Better than it cost during Black Friday, and over £100 off its regular price. 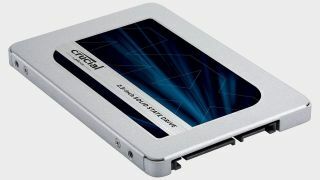 If you're looking for a great UK SSD deal for Boxing Day, check out this price on the Crucial MX500 1TB SSD. It retailed for over £200 late last year, but now it's at its best ever price on Amazon UK: £110.99. For the record, during Black Friday we covered this drive at its previous low of £128, so you're making a big saving on what was already a great price. Regular readers might know that the Crucial MX500 ranks highly on our list of the best SSDs, and 1TB should offer enough storage to keep you going. By 2018's hungry standards, that's, like, 10 blockbuster games! We described the Crucial MX500 as being a perfect mix of price/performance/reliability, with no obvious weak points that we could pick out.